Identifying high-risk atherosclerotic plaques is necessary for guiding the management and preventing the occurrence of severe cardiovascular events . A variety of noninvasive molecular imaging approaches can detect atherosclerosis on a subcellular level and identify suspected vulnerable plaques including ultrasound molecular imaging (UMI), which is widely available, inexpensive, and well-suited to high-throughput evaluation of atherosclerotic phenotypes [2, 3]. UMI can be used to detect molecular targets on the surface of activated platelets and endothelial cells that are accessible to microbubbles (MBs), including activated von Willebrand factor (vWF) for platelet adhesion [4, 5], vascular cell adhesion molecule-1 and P-selectin for inflammation [5-7], and vascular endothelial growth factor receptor-2 and interleukin-8 for neovascularization [8, 9], all of which are expressed on the endothelial surface. To date, there are no reports of an atherosclerotic profile of activated platelets and thrombosis obtained by UMI. While these play an important role in the progression of atherosclerotic lesions [10, 11], more often, atherothrombosis is asymptomatic and insidious , and can be a warning sign for high-risk plaques which can potentially be detected by UMI of activated platelets. The glycoprotein (GP) IIb/IIIa complex, also known as αIIbβ3 integrin, is the major receptor expressed on the surface of activated platelets and is essential for their interactions with other activated platelets and adjacent cells in atherothrombosis [11-13]. Platelet aggregation and GP IIb/IIIa expression on the circulating platelet surface or atherosclerosis were found to be higher in acute coronary syndrome or unstable angina than in stable angina or healthy volunteers [14-18]. Thus, the GP IIb/IIIa receptor is a potential marker for imaging aggregated platelets in atherosclerotic plaques. However, data on the correlation between GP IIb/IIIa on platelets in advanced atherosclerotic lesions and plaque severity are limited, and it is unclear whether GP IIb/IIIa on activated platelets can serve as a biomarker for high-risk plaques. Peptides containing the Arg-Gly-Asp (RGD) sequence are highly adhesive for GP IIb/IIIa [19, 20]. Cyclic (c) RGD has 30-fold greater affinity for the GP IIb/IIIa complex than the linear form [21, 22], which is particularly advantageous for binding under the conditions of rapid blood flow that occur in atherosclerotic arteries . We recently developed a cRGD-modified MB (MB-cRGD) that is capable of binding to GP IIb/IIIa on activated platelets and thrombi in large arteries [24, 25]. The current study examined whether GP IIb/IIIa receptors on activated platelets that are adhered and aggregated on the endothelium can serve as a biomarker of atherosclerotic plaque instability, and can be identified and quantified by contrast-enhanced ultrasound using MB-cRGDs. The study protocol was approved by the Animal Research Committee at Southern Medical University, and all procedures were performed in accordance with the Institutional Guidelines for Animal Research and complied with the Guide for the Care and Use of Laboratory Animals published by the United States National Institutes of Health. Four groups of mice were used in this study: apolipoprotein E-deficient (ApoE-/-) mice purchased from the Vital River Laboratory Animal Technology Co. Ltd. (Beijing, China) and maintained on a hypercholesterolemic diet (HCD, containing 21% fat and 0.15% cholesterol by weight) (ApoE-/-+HCD; n=30); ApoE-/- mice fed a normal chow diet (ApoE-/-+chow; n=18); wild-type C57BL/6 mice on an HCD (C57BL/6+HCD; n=18); and wild-type mice fed normal chow (C57BL/6+chow; n=18). Mice were maintained on their respective diets for 30 weeks starting at 6 weeks of age according to a previous study , and then 6 mice in each group were randomly selected for the UMI and histopathological examination, 6 other mice in each group were randomly selected for injection with platelets labeled with the fluorescent dye calcein-AM and examination by fluorescence microscopy, and 12 mice randomly selected from the ApoE-/-+HCD group served as negative controls, with half administered calcein-AM only and the other half (autofluorescence control group) administered phosphate-buffered saline (PBS) without calcein-AM. The remaining 6 mice in each group were used to perform UMI blocking experiments (Fig.1). Supplementary in vitro experiments were carried out to evaluate the potential mechanism of GP IIb/IIIa to serve as a biomarker of vulnerable plaques (see Supplemental Materials for details). The GP IIb/IIIa-targeted and negative control MBs (MB-cRGD and MB-CON, respectively) were generated by conjugating MBs to cyclic Arg-Gly-Asp-D-Phe-Cys (molecular weight = 578.65, C24H34N8O7S) and cyclic Arg-Ala-Asp-D-Phe-Val (molecular weight = 588.67, C27H40N8O7) peptides, respectively, as previously described . The binding characteristics of the MBs have been previously reported . MB-CON and MB-cRGD were characterized with a Coulter counter (Beckman Coulter Inc., Brea, CA, USA) to determine the MB size and concentration (see Supplemental Materials for details). After counting, the MBs were diluted with saline to a concentration of 1×107 and their in vivo half-life was measured (see Supplementary Materials for details). Peptides were synthesized by Peptides International Inc. (Louisville, KY, USA). Freshly isolated platelets were obtained from whole blood collected from normal healthy C57BL/6 mice and washed twice with PBS. The platelets were incubated with calcein AM (300 ng/ml in PBS; Invitrogen, Carlsbad, CA, USA) for 15 min in the dark as previously described . Fluorescence-labeled platelets were injected into four different mouse groups through the tail vein (n=6 each); with an equivalent amount of calcein-AM without platelets injected into the negative control mice (n=6) and PBS without calcein-AM injected into the autofluorescence control ApoE-/-+HCD mice (n=6). Animals were sacrificed 15 min after injection, and the aorta was harvested and immediately frozen in optimum cutting temperature medium. The tissue was sectioned on a cryostat, visualized at 480 nm under an epifluorescence microscope, and imaged with a C150L charge-coupled device camera (Pixera, Santa Clara, CA, USA). Illustration of the experimental protocol. Abdominal aorta tissue samples for the UMI study were fixed in situ with 2.5% glutaraldehyde, and a subset of these was prepared for EM following a standard procedure. The luminal surface was observed by scanning EM (S-3000N; Hitachi, Tokyo, Japan) operated at 20 kV. Platelets adhered to the surface of the vessel lumen were quantified by counting the average number of platelets over 10 optical fields (25.2×25.2 mm per field). Transmission EM (Tecnai G2Spirit; Fei, Hillsboro, OR, USA) was used at 80 kV to examine activated platelets in the tissue of ApoE-/-+HCD mice. Samples of the abdominal aorta for histopathologic examination were obtained from all 24 mice used in the UMI study. Hematoxylin and eosin and Masson's trichrome (MST-8003; Matxin Labs Pvt. Ltd., Bangalore, India) staining and immunohistochemistry were performed on paraffin-embedded serial sections cut at a thickness of 4 μm. Immunohistochemistry was performed using a rabbit polyclonal primary antibody against mouse α-smooth muscle actin (α-SMA), cluster of differentiation (CD)68, or GP IIb integrin (ab5694, ab125212, and ab63983, respectively; all from Abcam, Cambridge, MA, USA) to label smooth muscle cells (SMCs), macrophages, and platelets, respectively. Five representative serial sections each of the proximal, intermediate, and distal ends of the abdominal aorta were selected from each animal. Lipid deposition and collagen fiber content were measured by planimetry  and expressed as a percentage of total plaque area. The area of positive immunoreactivity was quantified using Image-Pro Plus (Media Cybernetics, Rockville, MD, USA) and expressed as a percentage of the total area of the plaque or vessel wall. The SMC and macrophage contents of plaque were quantified as percentages of positive to total plaque area. The GP IIb/IIIa content of plaques was measured by two methods: as percentages of GP IIb/IIIa expression in the plaque and of GP IIb/IIIa coverage of the endothelium, as previously described . Histopathologic indicators (α-SMA, CD68, and GP IIb/IIIa expression) were quantified at three selected sites and averaged per section per site. All measurements and analyses of UMI, scanning EM, histology, and immunolabeling data were performed by individuals who were blinded to the experimental design. The necrotic center/fiber cap (NC/FC) ratio was measured, and plaque vulnerability index was calculated using the formula [29, 30]: vulnerability index = (lipid deposit and macrophages) / (collagen fibers and SMCs). UMI was performed on 24 mice using a Sequoia ultrasound system with a high-frequency 15L7 linear-array probe secured in place using Cadence contrast pulse sequencing with contrast harmonic imaging (Siemens Medical Systems, Mountain View, CA, USA). The abdominal aorta was imaged by conventional ultrasound at 15 MHz to optimize the imaging plane along the longitudinal axis at a centerline frequency of 7 MHz and mechanical index of 0.18. Gain settings were adjusted to and maintained at levels just below the visible noise speckle. Real-time images of the aorta were acquired at an index of 0.18 for 10 min after intravenous injection of 1×106 MB-cRGD or MB-CON in a total volume of 0.1 ml in a random order; the mechanical index was transiently increased to 1.0 for 3 s to destroy adhered MBs, and post-destruction images were acquired at an index of 0.18 to obtain the background signal as previously described [4, 6, 31]. To identify the signal associated with retained MBs, three post-destruction contrast frames representing the signal from circulating MBs were averaged and digitally subtracted from three averaged pre-destruction frames using Yabko MCE2.7 image analysis software (University of Virginia, Charlottesville, VA, USA) and then color-coded; background-subtracted video intensity (VI) was measured from a region of interest encompassing the abdominal aorta. To demonstrate the high affinity of MB-cRGD for the GP IIb/IIIa receptor in vivo, a competitive inhibition experiment was performed using 24 mice. Eptifibatide (integrilin), a GP IIb/IIIa antagonist used in clinical practice, was injected at a dose of 1.8 μg/g to saturate integrins followed by injection of MB-cRGD or MB-CON and performance of contrast enhanced ultrasound. Data were analyzed using SPSS v.13.0 (SPSS Inc., Chicago, IL, USA) and are presented as the mean ± standard deviation. Comparisons between two or four groups were performed with the independent-samples t-test and one-way analysis of variance, respectively. A Bonferroni correction was calculated for multiple comparisons of continuous variables with equal variances (determined by the homogeneity of variance test), while Dunnett's T3 test was used for multiple comparisons without equal variances. Spearman rank correlations were used to assess the linear correlation between selected variables. A P value <0.05 was considered statistically significant. Freshly isolated platelets were labeled with fluorescent dye (Fig. 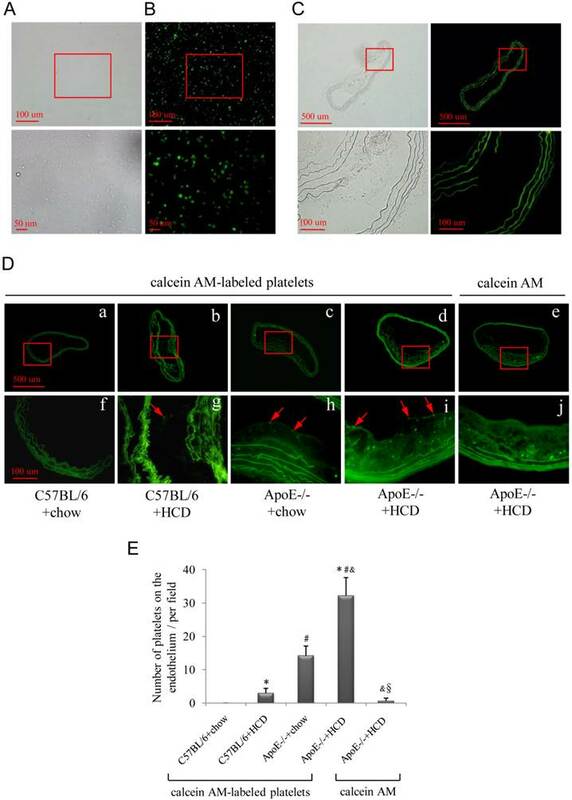 2A, B), and activated platelets adhering to the atherosclerotic lesions were observed by epifluorescence microscopy (Fig. 2D), with the highest numbers observed after injection of fluorescence-labeled platelets into the ApoE-/-+HCD group (Fig. 2Dd, i) followed by ApoE-/-+chow, C57BL/6+HCD and C57BL/6+chow groups (P<0.05; Fig. 2E). There were no fluorescence-labeled platelets observed on the endothelium of the negative control group (Fig. 2De, j), or on atherosclerotic plaque in the autofluorescence control group (Fig. 2C). The aggregation of platelets on the luminal surface of the endothelium was examined by scanning EM (Fig. 3A). In ApoE-/-+HCD group, much more platelets were recruited in the atherosclerotic lesions, while some of them aggregated, suggesting an adhering to each other (Fig. 3Ad, h). Similar to results obtained with the fluorescent probe, the highest number of platelets was observed in the ApoE-/-+HCD group, followed by ApoE-/-+chow, C57BL/6+HCD, and C57BL/6+chow groups (P<0.05; Fig. 3B). Because the size of platelet is variable (diameter may differ from 1-8 μm) , thus it is not reliable enough to identify platelet according to its size by using scanning EM. We further confirmed the structure of platelet by transmission EM. We noted that the platelets could be recruited in the atherosclerotic plaque (Fig. 3Ca) or bind to endothelial cells (Fig. 3Cb), and the microparticles, a feature structure of platelet, could be clearly observed in the platelets (Fig. 3Cc, d). Furthermore, thrombi—which are enriched in platelets and contain a large number of red blood cells (RBCs) and an abundance of fibrin—were detected at the site of vascular injury (Fig. 3D). GP IIb/IIIa expression in abdominal aortic plaques was assessed in the four experimental groups (Fig. 4A); GP IIb/IIIa coverage of the endothelium was highest in the ApoE-/-+HCD group, followed by ApoE-/-+chow, C57BL/6+HCD, and C57BL/6+chow groups (P<0.05; Fig. 4B), and a similar expression pattern was observed in plaques (Fig. 4C). Interestingly, GP IIb/IIIa coverage of the endothelium was correlated with GP IIb/IIIa expression in plaques (Fig. 4D), and GP IIb/IIIa-rich thrombi were observed at the site of vascular injury (Fig. 4E). Attachment of fluorescently labeled platelets to the atherosclerotic endothelium. (A, B) Fluorescently labeled platelets were visualized by light (A) and epifluorescence (B) microscopy. Platelets were injected into wild-type (C57BL/6) or ApoE-deficient (ApoE-/-) mice maintained on chow or an HCD. (C) Representative image of an aorta from the autofluorescence control group. (D) Representative images of the aorta of mice from the four experimental groups (a-d; corresponding high magnification images are shown in f-i). Fluorescent dye without platelets was injected into ApoE-/-+HCD mice (e; corresponding high magnification image is shown in j). Fluorescently labeled platelets aggregated on the endothelium of the aorta (red arrows in g-i). (E) Quantitative analysis of fluorescently labeled platelets (n=6 per group). Data represent mean ± standard deviation. *P<0.05 vs. C57BL/6+chow, #P<0.05 vs. C57BL/6+HCD, &P<0.05 vs. ApoE-/-+chow, §P<0.05 vs. ApoE-/-+HCD+platelets. 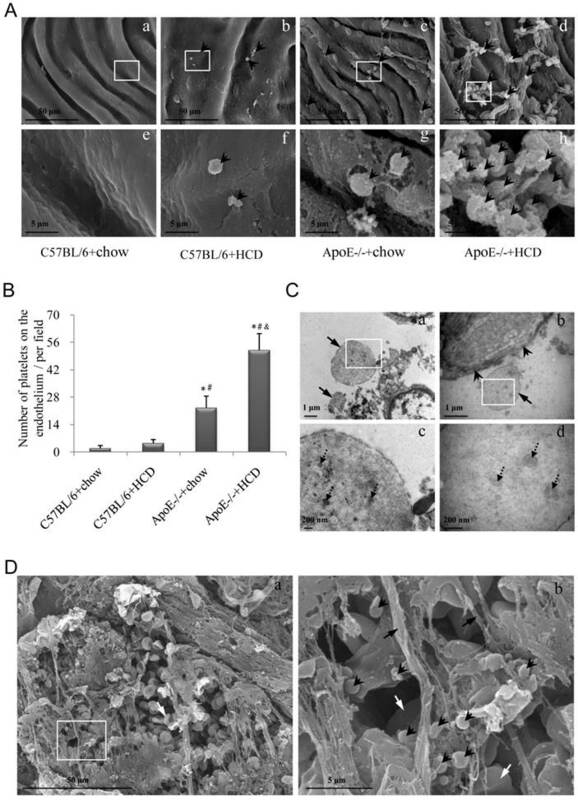 Platelet adhesion and aggregation on the endothelium of atherosclerotic plaques. (A) Platelets (arrowheads) adhering to the site of atherosclerotic lesions was observed by scanning EM. Panels from e-h are the magnified images of the corresponding white boxes in panels from a-d. Panel h shows the activated platelets binding to each other. The number of platelets was markedly increased in ApoE-/-+HCD group (panel d). 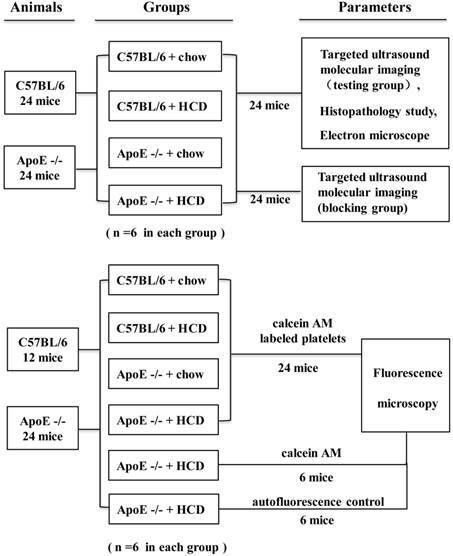 (B) Quantitative analysis of platelets based on scanning EM micrographs in panel A (n=6 per group), *P<0.05 vs. C57BL/6+chow, #P<0.05 vs. C57BL/6+HCD, &P<0.05 vs. ApoE-/-+chow. (C) Representative images of recruited platelets from abdominal aorta in ApoE-/-+HCD mice observed by transmission EM for structure confirmation of platelets. Panels c and d are the magnified images of the corresponding white boxes in panels a and b. Panel a: Two recruited platelets (arrows); Panel b shows the endothelium (arrowheads) and a platelet (arrow); Panel c and d show microparticles (dot arrows) in platelets. (D) Representative images of abdominal aorta from ApoE-/-+HCD mice observed by scanning EM, in which thrombi enriched in platelets (arrowheads), red blood cells (white arrows), and fibrin (black arrows) are shown. Immunohistochemical detection of glycoprotein (GP) IIb/IIIa. (A) Representative images of GP IIb/IIIa labeling in plaques (a-d) and the endothelium (e-h, arrows) of the aorta. Experimental groups are as described in the Figure 2 legend. Quantification for (B) GP IIb/IIIa coverage of the endothelium and (C) total plaque GP IIb/IIIa content are shown (n=6 per group). (D) Correlation between GP IIb/IIIa coverage of the endothelium and GP IIb/IIIa expression in plaques. (E) Representative images of thrombi enriched with GP IIb/IIIa (b, arrows) in an ApoE-/-+HCD mouse. Hematoxylin and eosin and Masson's trichrome staining, as well as α-SMA and CD68 immunolabeling of abdominal aortic plaques (Fig. 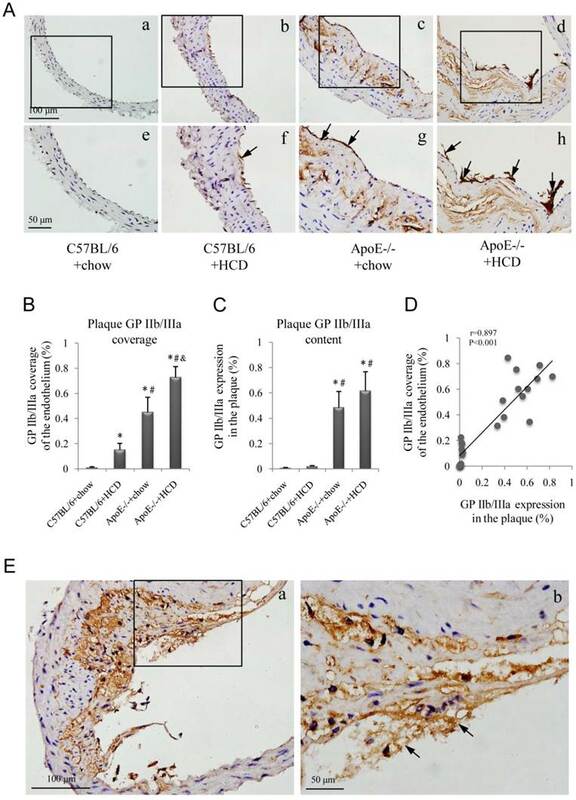 5A), revealed the highest percentage of macrophage-positive to total plaque area, NC/FC, and vulnerability index in ApoE-/-+HCD mice, followed by ApoE-/-+chow, C57BL/6+HCD, and C57BL/6+chow mice (P<0.05; Fig. 5C-E). In contrast, the percentage of SMC to total plaque area showed the opposite trend (Fig. 5B). Notably, GP IIb/IIIa coverage of the endothelium and expression in the whole plaque correlated with plaque indicators such as vulnerability index and NC/FC (Fig. 5F-I). To test the effect of inflammatory stimulation on endothelia, human umbilical vein endothelial cell (HUVECs) were stimulated with various concentrations of TNF-α and vWF expression was assessed. We found that TNF-α-induced vWF expression on HUVECs as well as vWF-induced GP IIb/IIIa expression on platelets was dose-dependent (Fig. 6A-D). The specificity of the immunoreactivity was confirmed by the absence of fluorescence in HUVECs or platelets incubated with secondary antibodies alone (Fig. 6A, C control). Hence, GP IIb/IIIa functions as a biomarker of vulnerable plaques as a result of inflammation and vWF activation, in accordance with previous findings . Background-subtracted VI (Fig. 7A) for MB-cRGD and MB-CON were comparable in both the testing and blocking groups in C57BL/6+chow mice, but was significantly higher for MB-cRGD compared to MB-CON in the other three testing groups, with the highest value observed for ApoE-/-+HCD followed by ApoE-/-+chow and C57BL/6+HCD groups. Treatment with Eptifibatide, a GP IIb/IIIa antagonist, decreased the VI to the level of MB-CON in these groups (P<0.05; Fig. 7B), suggesting that the binding between MB-cRGD and GP IIb/IIIa receptor was substantial inhibited by Eptifibatide. The VI of MB-cRGD in the testing group was also correlated with GP IIb/IIIa coverage of the endothelium and expression in plaques (Fig. 7C, D), as well as with vulnerability index and NC/FC (Fig. 7E, F). The results of this study demonstrate that GP IIb/IIIa receptors on activated platelets adhered to and aggregated on the endothelium can serve as biomarkers for plaques that can be identified and quantified ultrasonically. Specifically, it was shown that UMI with MBs targeted to GP IIb/IIIa receptors can detect atherosclerosis and high-risk plaques. Platelet aggregation and thrombosis of the arterial endothelium play a pivotal role in the pathogenesis of plaque destabilization . In addition, we demonstrated that activated platelets were frequently recruited and adhered to each other (Fig. 3Ah) as well as to the injured endothelial surface in high-risk plaques (Fig. 3Cb), in agreement with previous report . The interaction is mainly mediated by integrin αIIbβ3, vWF, fibrinogen, fibrin, and/or fibronectin [34-36], suggesting that the extent to which activated platelets adhered to the endothelial surface of atherosclerotic plaques was positively associated with the degree of plaque instability. This was supported by the finding that fluorescence-labeled platelets adhered to the endothelium of atherosclerotic lesions and GP IIb/IIIa coverage of the endothelium were correlated with both NC/FC and vulnerability index. Finally, results from the in vitro study suggest that the inflammatory reaction leading to the increased expression of endothelial vWF initiated platelet activation/aggregation, resulting in the high expression of GP IIb/IIIa on activated and adhered platelets. Thus, these GP IIb/IIIa receptors could be a biomarker for vulnerable plaques that signals advanced atherosclerotic lesions, and their quantification could be used to evaluate atherosclerotic progression and vulnerability. Several studies have examined the feasibility of targeting the GP IIb/IIIa of activated platelets using different agents in vitro and in vivo [37-39]. Recently, a non-specific anti-GP IIb/IIIa chimeric monoclonal antibody, abciximab; and a specific monoclonal antibody against ligand-induced binding sites were used successfully for the molecular imaging of thrombosis [39, 40]. However, the noncovalent streptavidin-biotin interactions in these agents have immunogenic side effects; abciximab interferes with the GP IIb/IIIa receptor and prevents platelet aggregation and thrombus formation, which can lead to bleeding , thereby limiting its clinical applications. In contrast, the risk of bleeding associated with RGD is much lower due to the short duration of GP IIb/IIIa receptors blocking by this peptide . In addition, RGD peptides and their analogs, which can be readily bound covalently to contrast agents, have a high affinity for GP IIb/IIIa [20, 24] and have been widely used to probe integrin function in various biological systems [24, 43], making them ideal molecular probes for targeting GP IIb/IIIa. A 30-fold higher binding affinity for GP IIb/IIIa is exhibited by cRGD than the linear peptide [21, 22], which is particularly useful under conditions of rapid blood flow that occur in atherosclerotic arteries. Histopathologic examination of atherosclerotic plaques. (A) Representative images of aortic tissue as visualized by hematoxylin and eosin and Masson's trichrome staining, or labeled with antibodies against α-SMA and CD68. Experimental groups are as described in the Figure 2 legend. Quantitative analyses of (B) total plaque SMCs and (C) macrophage content are shown (n=6 per group). (D) Plaque NC/FC and (E) vulnerability index were calculated. Correlations between plaque vulnerability index and (F) GP IIb/IIIa coverage of the endothelium and (G) GP IIb/IIIa expression in the plaque, and between plaque NC/FC and (H) GP IIb/IIIa coverage of the endothelium and (I) GP IIb/IIIa expression in the plaque were determined. TNF-α increases endothelial vWF expression while GP IIb/IIIa expression on platelets is induced by vWF. 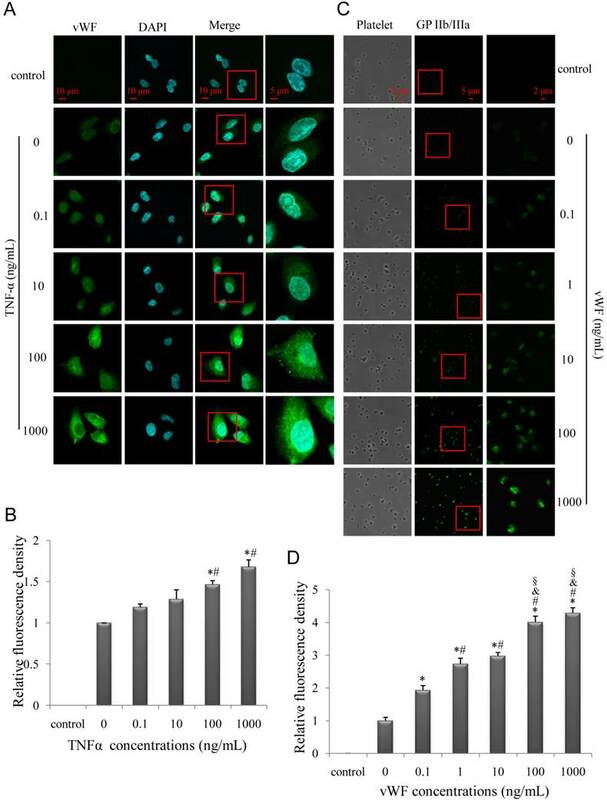 (A, C) Representative confocal images of HUVECs (A) and platelets (C); HUVECs and platelets were stimulated with various concentrations of TNF-α and vWF, respectively, and evaluated for vWF and GP IIb/IIIa expression, respectively. (B, D) Quantitative analysis of relative fluorescence signal intensity of vWF (B) and GP IIb/IIIa (D). Results are expressed as mean ± standard deviation. *P<0.05 vs. 0 ng/ml, #P<0.05 vs.0.1ng/ml, &P<0.05 vs. 1 ng/ml, §P<0.05 vs.10 ng/ml. UMI of atherosclerosis in the test and inhibitor-treated mice and correlation with histopathologic indicators. (A) Background-subtracted, color-coded images were obtained 10 min after injection of a MB-cRGD or negative control (MB-CON) peptides. Experimental groups are as described in the Figure 2 legend. (B) The VI of MB-cRGD and MB-CON in the test mice and those pre-treated with eptifibatide was quantified (※P<0.05, MB-cRGD vs. MB-CON; §P<0.05 MB-cRGD inhibited vs. MB-cRGD; n=6 per group). Correlations between the VI of MB-cRGD in the test group and (C) GP IIb/IIIa coverage of the endothelium, (D) GP IIb/IIIa expression in plaques, (E) plaque vulnerability index, and (F) NC/FC are shown. The present study found robust correlations between the VI of MB-cRGD on plaques and plaque vulnerability indicators, indicating that UMI with MBs targeted to GP IIb/IIIa receptors is capable of detecting atherosclerosis and high-risk plaques. MB-cRGDs mainly target GP IIb/IIIa receptors present on the exposed endothelial cell and thrombus surface, since MBs do not leave the intravascular space or enter the thrombus entirely. 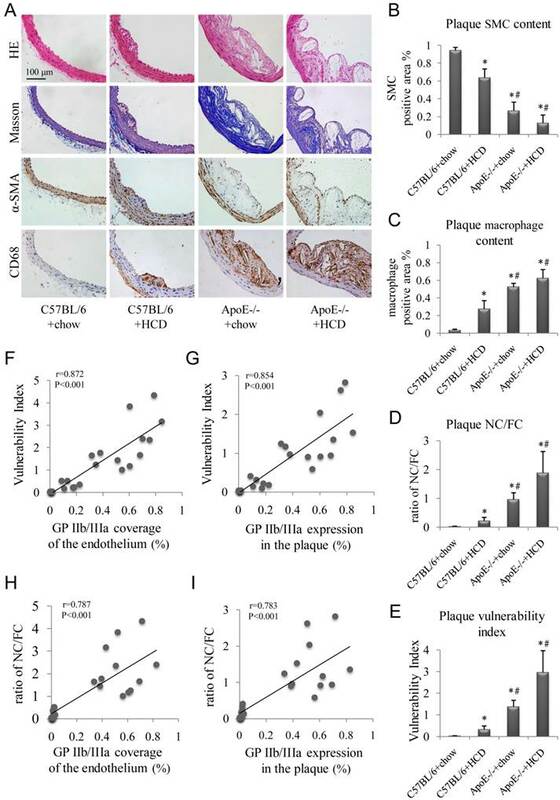 Moreover, GP IIb/IIIa coverage of the endothelium was correlated with expression in plaques, and therefore provides an accurate readout of GP IIb/IIIa expression on the whole plaque, serving as an indicator of plaque vulnerability. The correlation between GP IIb/IIIa coverage of the endothelium and NC/FC as well as vulnerability index also provides evidence in support of this possibility. Fluorescent signals similar to those from fluorescently labeled platelets were observed in the sub-endothelial lipid center. One explanation for this is that platelets aggregated at the site of injury and neovascularization via αIIbβ3 ; alternatively, fluorescently labeled platelets may have leaked from the lipid core through a ruptured vessel. The green spots within atherosclerotic plaques in the negative control mice may also be attributable to the leakage of fluorescent-dye, since the effect of autofluorescence was eliminated. 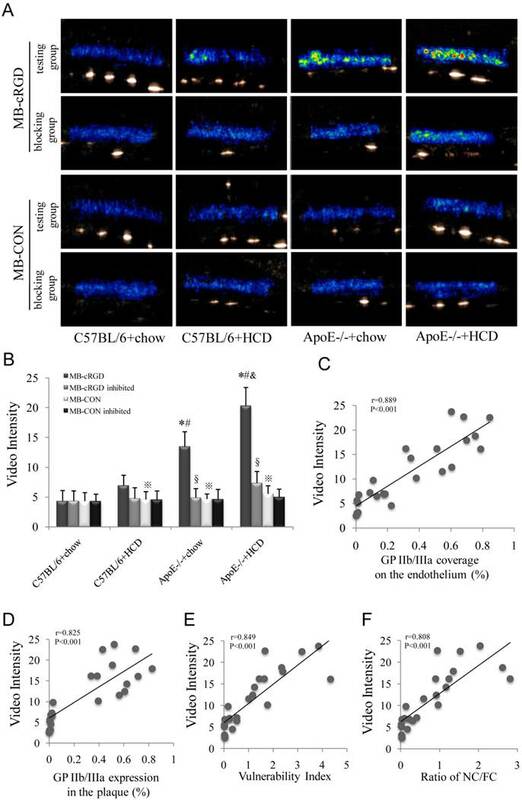 Local VI accumulation in the aorta of ApoE-/-+HCD mice administered MB-CON may have resulted from the nonspecific attachment and/or endocytosis of MB-CON by activated leukocytes or the entrapment of MB-CON by fibrin mesh . It was reported that the size variation of platelet is large (the diameter of the platelet is ranging from 1~8 μm under transmission EM) , which is in agreement with our findings in this study (Fig. 3Ca). To confirm our judgment, we further observed the microparticles in the platelets by using transmission EM (Fig. 3Cc and d). We should pay attention to that MB-cRGD not only binds to GP IIb/IIIa but also other integrins, such as αvβ3, αvβ1, and αvβ6. Although their expression on activated platelets is much lower than that of GP IIb/IIIa [12, 46], they may contribute to the enhanced ultrasound signal from MB-cRGD, suggesting a limitation for the specificity of MB-cRGD to detect GP IIb/IIIa in activated platelets. MB-GP IIb/IIIa specific antibody may overcome this limitation, but it likely produces immunogenic side effects. In addition, our previous studies showed that MB-cRGD has a high capacity for binding at a continuous shear stress of 8 dyn/cm2 [24, 25]. Although it did not accurately mimic hemodynamics in atherosclerotic lesions in vivo, a high binding affinity was achieved in the current atherosclerotic model, in which binding may be enhanced during the diastolic phase between pulses when shear stress is markedly altered . Furthermore, similar to previous studies, only a small fraction of the atherosclerotic plaques that were generated could be defined as vulnerable plaques, that could cause severe cardiovascular events; however, plaque vulnerability was observed in many mice, especially in those that were ApoE-deficient and on an HCD, as evidenced by instability indicators associated with atherosclerotic vulnerability . In addition, it is possible that the sonication that was applied to disrupt MBs potentially destroyed the tissue, particularly the nutrient vessels of atherosclerotic plaques; however, there was no evidence of this at a mechanical index of 1.0. Indeed, the threshold mechanical index for UMI that can lead to tissue and/or microvessel destruction has yet to be established. GP IIb/IIIa of activated platelets on the plaque endothelium is a novel, reliable biomarker for advanced atherosclerotic lesions that can be used to identify plaque instability by noninvasive molecular imaging and assist in the prevention of acute cardiovascular events. This study was supported by grants from the National Basic Research Program of China (973 Program; no. 2013CB733804), the Team Program of Natural Science Foundation of Guangdong Province, China (no. S2011030003134), and the National Natural Science Foundation of China (nos. 81227801 and 81271640 to J.B.).